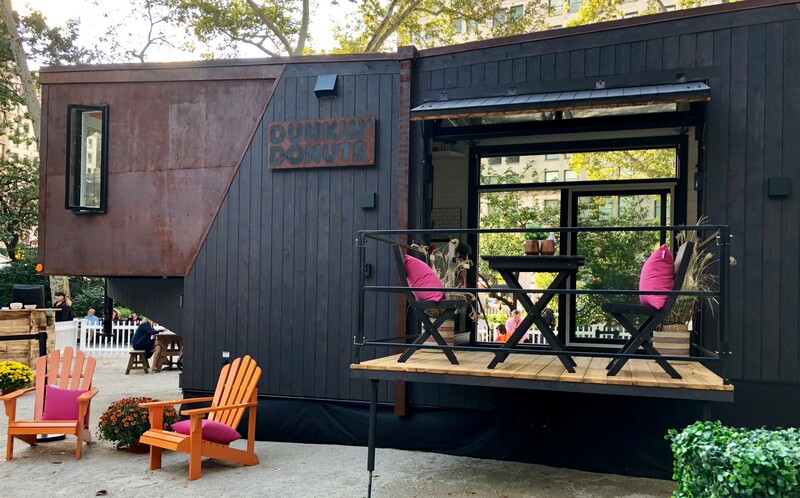 Dunkin' Donuts Coffee at Home (the company that sells products in grocery stores) is hosting a pop-up tiny home that runs on used coffee grounds this week in New York City, which Marketing Dive toured before its official opening to the public on Oct. 4. The company partnered with Blue Marble Biomaterials to extract oil from 65,000 pounds of used coffee to power the fully functional space, along with New Frontier Tiny Homes and actress Olivia Wilde on construction and design. The transportable house packs in a queen-sized bed, dishwasher, hot tub and shower, fold-out patio, dining nook, hidden storage spaces, full kitchen and dual washer-dryer in 275 square feet — larger than some apartments that surround the installation in Madison Square Park — and is complete with pink and orange accents to echo the brand's colors. Outside, visitors can play games and sample coffee. For those that can't tour the house before the activation ends on Saturday, Oct. 6, a 360-degree video walkthrough will be released online. People can also enter for a chance to win a two-night stay when the house parks in Dunkin's home state of Massachusetts. After that, the space will be available to reserve through Airbnb, according to Jason Walters, J.M. Smucker Company's senior brand manager. Apparently, not only does America run on Dunkin', but now, so does an entire home. The pop-up installation is an attention-grabbing strategy for Dunkin' Donuts Coffee at Home to power deeper connections with fans of the coffee marketer. While most consumers are already familiar with Dunkin', experiential activations and other creative marketing efforts aim to break through to ad-fatigued consumers — especially younger folks that prefer in-person interactions with brands — and in the case of the tiny home, drive home the corporate slogan. "We kept coming back to the idea of 'how can we bring our brand to life?' We fuel people at home, so why don't we make a home that's also fueled by Dunkin'?" Walters told Marketing Dive. By setting up the house in New York's busy Madison Square Park a day before the tours began, the company was able to drum up excitement before the official kickoff, especially as staff handed out coffee samples and encouraged passersby to play games, register for the sweepstakes, learn about the installation and return later in the week for a peek inside the house. Outside, visitors can play games and sample coffee. Dunkin's at-home coffee producer is tapping into the tiny home trend and broader movement toward reducing waste and promoting sustainability, as the house burns fuel made from coffee grounds that would otherwise be tossed. By extending the campaign to include a two-night vacation sweepstakes and an Airbnb tie-up, the coffee company's immersive experiences will likely push a stronger sense of memorability and brand connection among its target consumers. This pop-up house comes as companies continue to embrace experiential events to market product releases, film premieres or simply forge direct connections with customers. In August, The North Face debuted a pop-up showroom 2,100 meters high in the Italian Alps to kick off its outdoor exploration-focused Pinnacle Project.